Are you missing a tooth or several teeth? Do you want your smile not to be spoiled by a missing tooth? Regain your self-confidence and get dental implants! Implantology is a highly specialized field of dentistry and inseparable part of dental care. 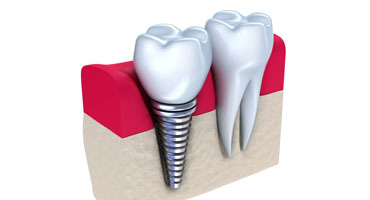 The term “implant” means in dentistry an artificial substitution of lost natural tooth, placed surgically into the jaw bone just on the place where the loss of one or more teeth occurred. 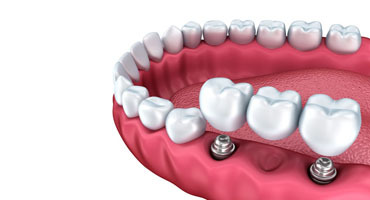 Implants are therefore used to replace individually lost teeth or as a support for fixed or removable dentures when most or all the teeth are gone. 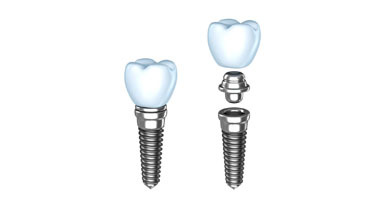 Modern implants are nowadays almost solely made out of pure titanium with a special surface finish. Titanium material grows reliably into the bone tissue and is well accepted by the human body, as well as by those allergic to other metals. Czech market is currently full of cheap, low quality systems from around the world. Our dental office offers placement of quality implants, proofed by research and time. We do not experiment with low-cost alternatives of implants, as many do not offer any guarantees for the future. Experience confirms, that such a cheap alternatives show a significantly higher percentage of complications and much shorter service life. You can have implants for whole your life. If you choose a quality system, you have a certainty that, for example later in your life, a single implant can be connected with another. 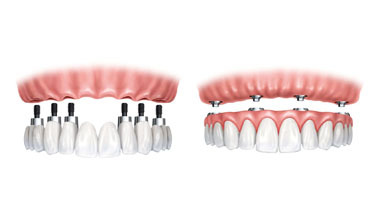 Two implants can already hold a bridge with four crowns, or four implants can support complete denture. Implants are investment for the future. Implants are not recommended only for patients in serious overall medical condition (e.g. uncontrolled diabetes), for young patients with incomplete bone development and for heavy smokers. Smoking and other diseases reduce the probability of success, which is over 96% by quality systems. Successful placement of implants is also ensured by the quality of the jaw bone, its density and volume. In case of poorer condition it is possible to strengthen the bone volume by so-called augmentation (by adding artificial bone). The success of treatment also depends on a thorough dental hygiene. The basis of the success is a perfect diagnostics – the examination of the quality and volume of patient’s jaw bone in particular. This is done prior to the procedure itself, including thorough planning and informing the patient. 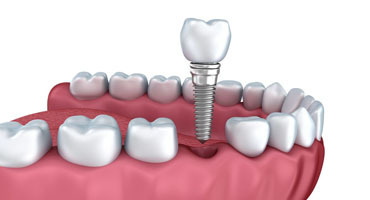 Once the dental implant is completely healed, which takes 3-4 months, the permanent prosthetic treatment is approached. During the healing process, client is equipped with provisional denture. The final, permanent treatment must be not only functional, but also aesthetic. We use the top implant system of German company BEGO in our dental office. The world market offers more than 2 000 different implant systems and Bego belongs to the Top 5. It is one of the world’s best and one of a few allowing treatment by all indications – depending of course on the quality and volume of jaw bones. We are one of a few in Czech Republic, who offers a computer-facilitated placement of implants. The operation is done with a help of BEGO Guide System. Data from CB CT scan are processed by special program called coDiagnostiX – data about quality and volume of jaw bone, data extracted from the scan of jaw bone model, as well as from a model of planned prosthetics (crown, bridge) – i. e. data about mucous membrane thickness and position and shape of prosthetics. Now we have all the necessary data to plan the position of implants, we know required length and diameter. To be able to place the implants to designated positions, this program enables to model a special operational template, made by 3D printer. With a help of this template, placed in the patient’s mouth, the operation itself – placement of implants – can start. determine the depth, diameter and direction (angulation) of the drill – and a save placement! In guided surgery we cooperate closely with top devices of HDC Kladno and Microdent, Ltd.